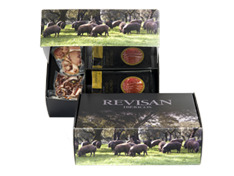 This premium box of grass-fed iberico ham contains 36 100 gr packs of iberico grass-fed ham. Obtained from the hindquarters of the iberico pig, it is characterized by its stylized form, with its black hoof, and by its marbling. Its colour is red with rosy tones and its flavor is intense, prolonged and full of unique aromas. 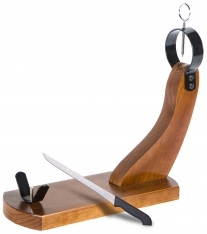 In Spanish, this product is known as "Jamón ibérico de cebo de campo Revisan Ibéricos cortado a mano-caja premium". 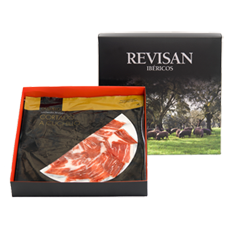 Format : This grass-fed iberico ham is delivered in a special Revisan Ibéricos presentation box. Storage : This grass-fed iberico ham should be kept refrigerated.